WASHINGTON, D.C. -- A piece of gun control legislation was defeated in the U.S. Senate today by a vote of 54-46. Senate Bill 649, titled Safe Communities, Safe Schools Act of 2013, would have created a national instant criminal background check system for a background check of every firearm sale, including sales at gun shows. "The gun lobby and its allies willfully lied about the bill," said President Barack Obama in a speech following the bill's defeat. "They claimed that it would create some sort of “big brother” gun registry, even though the bill did the opposite. This legislation, in fact, outlawed any registry. Plain and simple, right there in the text. But that didn’t matter. And unfortunately, this pattern of spreading untruths about this legislation served a purpose, because those lies upset an intense minority of gun owners, and that in turn intimidated a lot of senators." Sixty votes were needed for the bill's passage in order to overcome a filibuster promised by conservative Senators Marco Rubio (R-FL), Rand Paul (R-KY), Mike Lee (R-UT), and Ted Cruz (R-TX) to oppose "any legislation with additional restrictions on the Second Amendment rights of law-abiding citizens." "A majority of senators voted “yes” to protecting more of our citizens with smarter background checks. 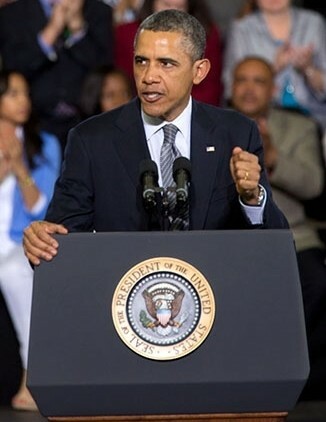 But by this continuing distortion of Senate rules, a minority was able to block it from moving forward," Obama said. Four Republican Senators crossed party lines and voted for the gun control bill: John McCain (R-AZ), Pat Toomey (R-PA), Susan Collins (R-ME), and Mark Kirk (R-IL) while five Democratic Senators from rural states voted against the control bill: Mark Pryor (D-AR), Heidi Heitkamp (D-ND), Mark Begich (D-AK), Max Baucus (D-MT), and Harry Reid (D-NV). Reid changed his vote from a "yes" to a "no" for procedural grounds.